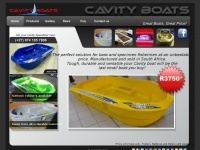 Manufacturer and sales of Cavity Boats South Africa. Small plastic fishing boats perfect for bass and specimen anglers. Great Boats, Great Price! Keywords: Cavity Boats Buy Small Bass Boat Plastic Fishing for Sale South Africa Carp for Speedster for Best Spesimen for Electric 5HP Dinghy. A profile of Cavityboats.co.za was found on the social network Facebook. The web server with the IP-address 154.0.168.30 used by Cavityboats.co.za is run by Afrihost-Brevis Computer Services (SA)(Pty) Ltd and is located in South Africa. This web server runs 1 other websites, their language is mostly english. The Cavityboats.co.za websites were developed using the programming language ASP.NET and served by a Microsoft-IIS server. XHTML 1.0 Transitional is used as markup language on the webpages. To analyze the visitors, the websites uses the analysis software Google Analytics. The website does not specify details about the inclusion of its content in search engines. For this reason the content will be included by search engines.